We love books based on and inspired by films, so we didn’t want to miss Fantastic Beasts and Where to Find Them, set in J. K Rowling’s Wizarding World. Also, we were lucky enough to be invited to an early preview screening of A Monster Calls, the film adaptation of the book by Patrick Ness. This was itself based on an idea by the writer Siobhan Dowd, who sadly passed away before she was able to write the book herself. We tell you about what we thought of both films, avoiding any spoilers, so you can enough both for yourself. 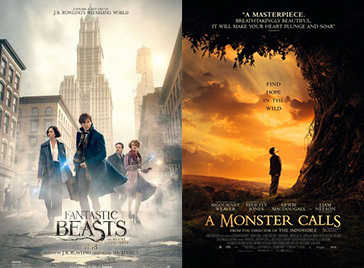 Fantastic Beasts is out now, and A Monster Calls is out in January 2017. It was great to hear from so many of you since the last podcast – don’t forget, you can leave us a comment below like ‘R Holmes’, a voicemail via the button on the home page, or email us on [email protected] like Anna. Episode 175. An Adventures With Words production. Hosted by Rob Chilver and Kate Neilan.